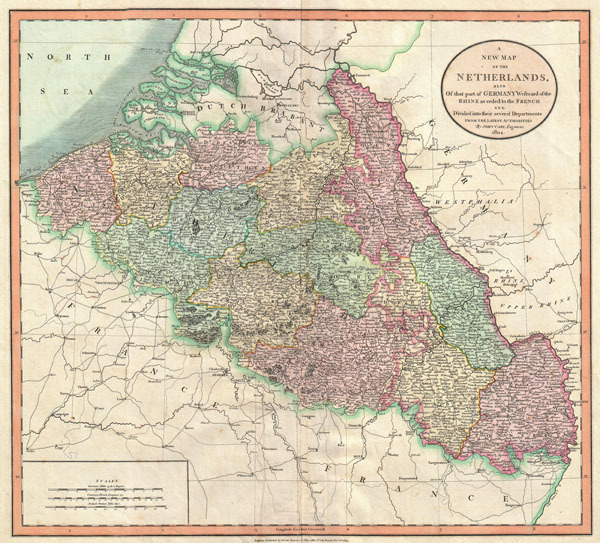 A New Map of Netherlands, also of that part of Germany westward of the Rhine as ceded to the French and divided into their several departments, from the Latest Authorities. Despite being entitled 'the Netherlands,' this map is John Cary's fine and attractive map of Belgium and Luxembourg. Belgium, as we know it today, did not emerge as an independent state until the Belgian Revolution of 1830. Highly detailed with color coding according to region. All in all, one of the most interesting and attractive atlas maps Belgium and Luxembourg to appear in first years of the 19th century. Prepared in 1804 by John Cary for issue in his magnificent 1808 New Universal Atlas. Very good condition. Blank on verso. Minor buckling. Minor creasing to the left and right of centerfold at confined to bottom of map. Rumsey 1657.015. Phillips (Atlases) 714. The Map Collector, issue 43, p. 40-47 (Atlas). National Maritime Museum, v. 3, no. 311.